Amaryllis bulbs can be picked up in just about any store these days to bloom around Christmas. Most people don’t know you can keep your bulb blooming for years. It is common to find Amaryllis bulbs for sale around this time of year. Many are grown during the Christmas season because of their festive red color and large flowers. Amaryllis flowers are really very easy to grow indoors. You can find them in almost any nursery or department store pretty much ready to go. They come with their own pots and planting medium and all you have to do is place the bulb in the pot and start watering. Amaryllis flowers are big trumpet shaped flowers that come in a variety of colors including red, pink, white, yellow and combinations of those colors. They bloom about eight weeks after planting and the flower stalks can top up to 2 feet. Several flowers will bloom on one stalk. Follow the directions on the box if you have purchased a ready to grow Amaryllis. If you just have the bulb you will have to find a pot that is very heavy and slightly larger than the bulb, leaving about 2” around the sides of the bulb. Because of the height of the flower it is necessary to either have a heavy pot that will not tip over or place heavy stones in the bottom of the pot to weight it down before putting in soil. Putting gravel in the bottom is a good idea since Amaryllis bulbs require good drainage. Place soil up to 75% of the pot and place the bulb (fat side with roots down) putting more soil around the bulb to the top of the pot. Insert a bamboo stake next to the bulb. You will need it eventually when the stalk gets tall. Just tie the stalk to the stake with knee high stockings or plant ties. Start to water, keep the soil moist but not wet, and you will have a bloom in about 7 to 8 weeks. Amaryllis bulbs require a lot of sunlight and warm temperatures so be sure to place them in a sunny window. Turn the pot every few days so the stalk doesn’t grow to one side. The bulb will benefit from a light dose of half strength water soluble fertilizer especially after it starts to bloom. Use fertilizer every 2 to 3 weeks if you like. If you don’t plan on keeping the bulb for another year you don’t have to do this. 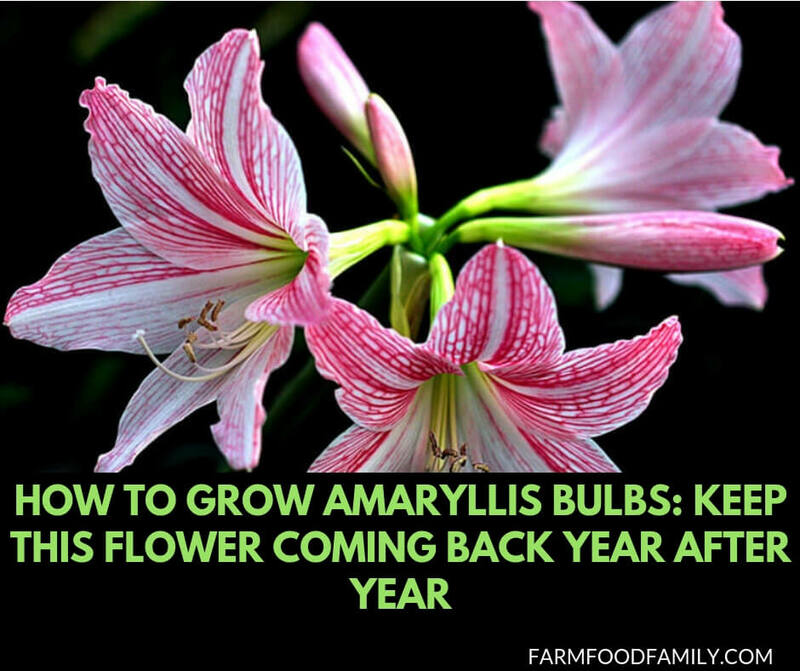 Contrary to popular belief an Amaryllis bulb will bloom for years. Just like your tulip bulbs the plant needs to have time to store energy in the bulb for the next season. Cut the flower stalk back to 2” above the bulb after blooming but allow the foliage to keep growing as long as you can. If you can keep the plant alive during the winter, place it outside in sunlight during the summer. Keep it watered and stop fertilizing in August when the foliage should start to yellow and die back. Remove yellow, dry foliage. The bulb has now become dormant and it should be September or October. Move the plant to a dry area with a temperature of about 40 to 50 degrees, turn the pot on its side, and don’t water. Six to eight weeks before you want the plant to bloom again, set it upright and start to water. This will signal the amaryllis to send out a flower stalk. Resume watering and move the plant to a warm, sunny spot again. Leaves should quickly follow along with flowers. When the flowers fade and the leaves turn yellow and dry cut the stalk and leaves back to just above the bulb. After a year or two the bulb will start to get bigger and you will have to repot it in a bigger pot. An added bonus – the stalks and flowers will get bigger too. Large flowered varieties are Apple Blossom (white trumpet blooms with rose, pink and lime colored throat), Minerva (red blooms with white stripes that form a star), Mont Blanc (huge white flowers), Red Lion (wide petaled flowers up to 10 inches wide), Picotee (white flowers edge with red and a green throat). There are also miniatures. Common varieties include Amoretta (deep pink fading to white with lime green throat), Santos (red petals striped with white), White baby (pure white with green throats). Trumpet varieties include Amputo (pure white with lime green throats), Misty (pink flowers with red throats and each petal tipped with white), Pink Floyd (raspberry colored petals with white veining and green throats). Even if your amaryllis only blooms one time, it will definitely be a show stopper as a table decoration or just drawing attention to a sunny window in the cold winter. I have a very rare Amarillo color. I would like to send you a photo of it. How do I do this. Please send yours to this email kim.farmfoodfamily[@]gmail.com. Please remove the [ and ] characters.